A look at some of the strongest trends in the US small cap universe. Two trends that could just be emerging. How Trendrating's Smart Momentum and Retracement scores capture the strongest trends. 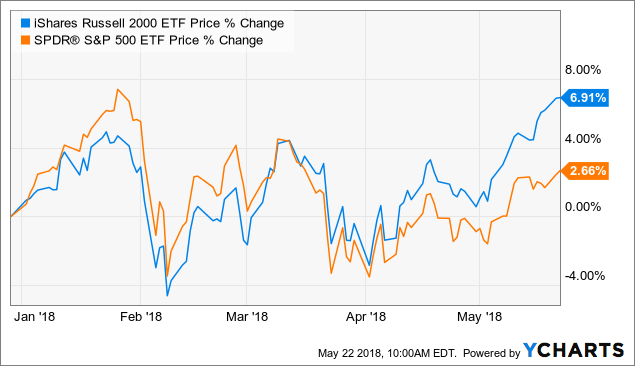 Small caps have outperformed large caps YTD, with the iShares Russell 2000 ETF (IWM) up nearly 7% compared to less than 3% for the SPY. Most of the outperformance has come in recent weeks and can be attributed in part to the trade war rhetoric. While the current status of the trade war is 'on hold', there's plenty of reasons to believe we are still in the early innings of trade negotiations. Investing in some small cap companies that are less exposed to foreign tariffs could be a winning strategy for the foreseeable future. Below, we rank the top ten companies in the Russell 2000 index as ranked by the Trendrating model. Trendrating captures trends by using its proprietary trend capture analysis, which scores over 18,000 stocks and ETFs globally. The names listed below are all exhibiting the strongest possible Smart Momentum Scores of 3.000. This score indicates a very strong bull trend and has proven to be a strong indicator of future performance. All names listed below are also near new highs, as securities that have fallen more than 10% from a recent high could be facing some recent headwinds. Gambling on a small cap company has worked out extremely well in recent weeks, after the US Supreme Court struck down the Federal law prohibiting sports gambling. 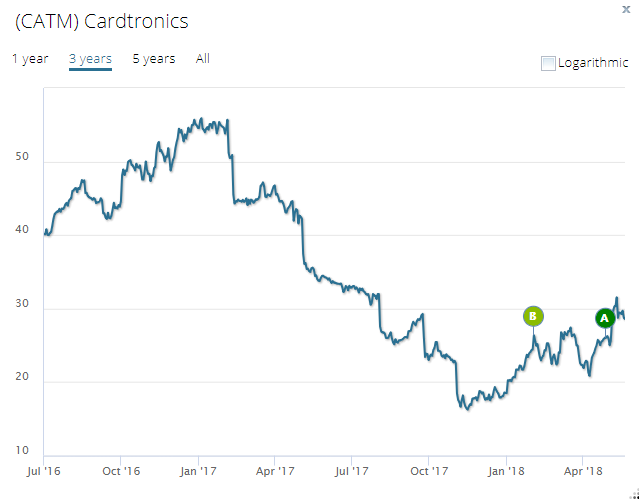 The Las Vegas based company is up more than 23% over the last month. 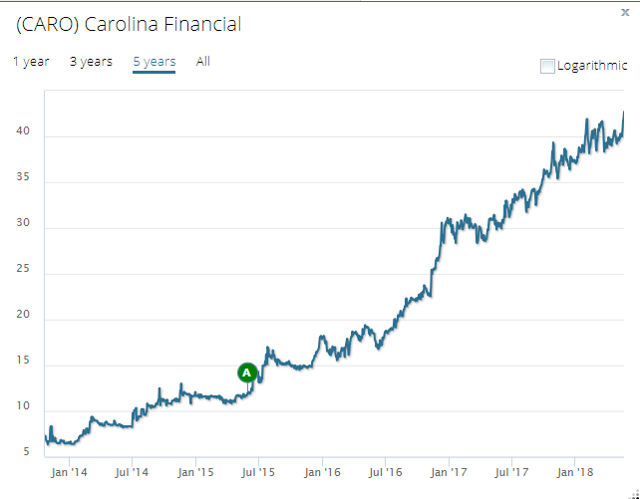 Since being rated an 'A' by Trendrating back in June of 2016, the stock has soared a whopping 500%. While banks across the country continue to benefit from last year's tax cuts and increasing interest rates, the smaller cap names have also seen the benefits of deregulation. Two east coast regional banks in particular are experiencing very strong trends, Community Bankers Trust (ESXB) and Carolina Financial (CARO). 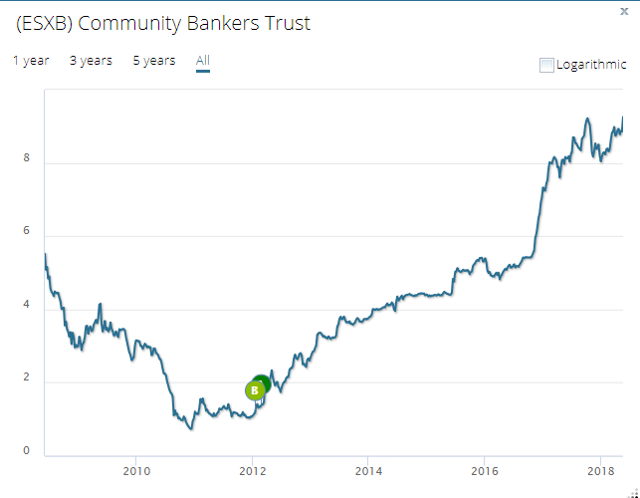 Community Bankers Trust, for example, has maintained an 'A' rating by Trendrating since March of 2012. Since then, the stock price has risen by more than 500%. 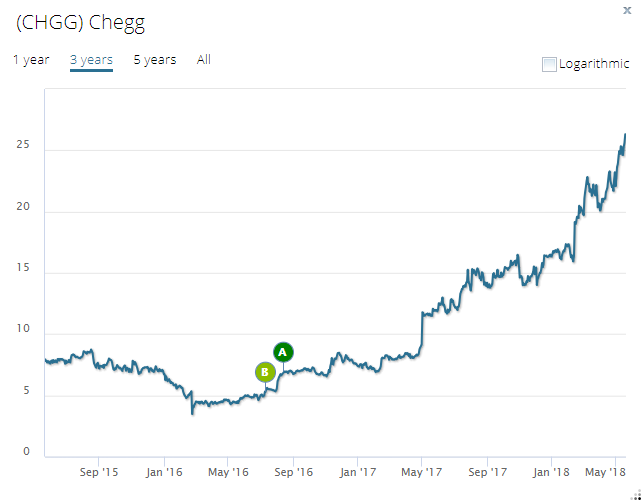 As college tuition keeps climbing, Chegg is the rare company helping students not pile up even more debt. Student debt now makes up 10% of the average debt for US households, or roughly $1.3 trillion nationwide. Chegg, however, helps keep the cost of textbooks affordable by renting out books for a semester. The stock is up 117% over the past 12 months and up 278% since being rated 'A' by Trendrating in August of 2016. The names and charts shown above discuss some very strong trends in the small cap universe. These names with high Smart Momentum Scores and low Retracement values have proven to outperform, but some may be wary of the huge gains already realized in their stock prices. The two companies below are strong trends that could be in the early stages of a long bull run. Each of these companies has been upgraded to 'A' within this calendar year. 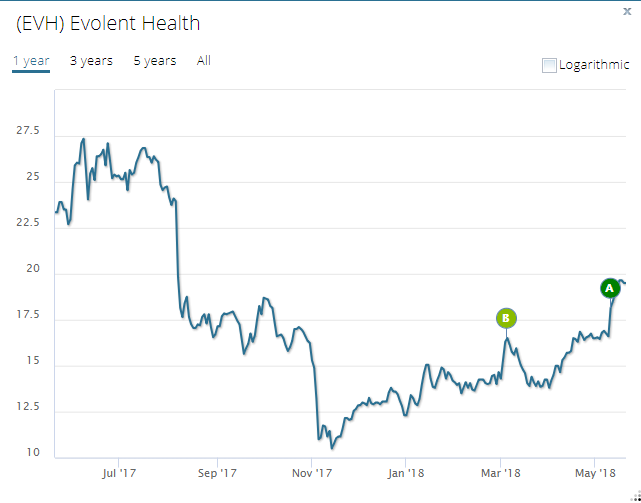 Evolent Health is an Arlington, Virginia based company founded in 2011 with a focus on managing costs for healthcare providers. They utilize "big data" analytics to focus on controlling costs and identifying opportunities for health systems, independent physician associations, and others. 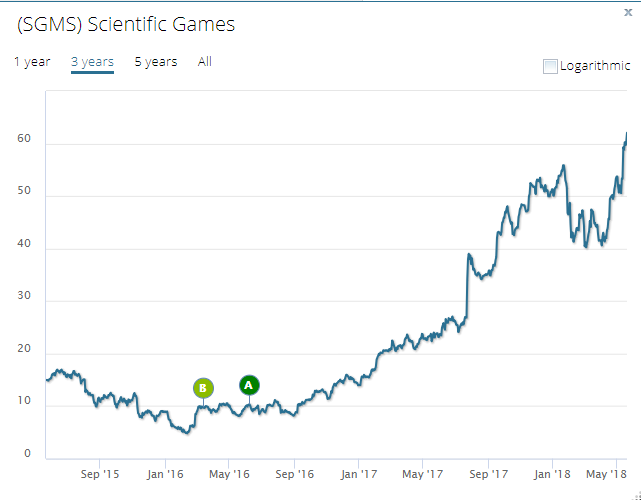 The stock was rated 'A' by Trendrating on May 10th and is already up 7% since that day. The Smart Momentum Score sits at 2.31. The world's largest non-bank ATM provider was upgraded to an 'A' on April 29th of this year. The shares are up ~10% since being rated, and the stock boasts a Smart Momentum Score of 2.29. The top ranked companies as rated by Trendrating do not all come from the same sector, indicating there are opportunities across the spectrum. Even the names with lower Smart Momentum Scores but that have seen recent upgrades come from many different sectors. The excel file attached here lists the rankings and performance for all of the Russell 2000 constituents.